Thirty to 50 million tonnes of ice have broken off the Tasman Glacier forming around 20 icebergs now floating in the Tasman Lake. Thirty to 50 million tonnes of ice have broken off the Tasman Glacier forming around 20 icebergs now floating in the Tasman Lake - adding more drama and spectacle to an already dramatic landscape. The process began earlier this month when the terminal face rose 20 to 40 metres thanks to a rain downpour which lifted millions of tonnes of ice from the water across the entire 600m width of the face. On August 18, a small section of that ice calved resulting in a massive and spectacular iceberg separating from the face. Sometime over the weekend, the rest of the uplifted ice broke away from the terminal face in the biggest ever calving in the lake's 35 year history. Glacier Explorers, which takes passengers on cruises on the Tasman Glacier Terminal Lake, will resume operations on 3 September, one month ahead of schedule due to an early spring melt and to take advantage of the opportunity to see the magnificent new icebergs. Denis Callesen, General Manager Tourism for Aoraki Mount Cook Alpine Village Ltd said the coming season promises visitors the most spectacular iceberg and glacier cruising season yet. "The scale of what's happening here is just enormous. The biggest iceberg is about 300m by 200m and 40m high - and that's only the 10% of the 'berg that we can see. Ninety percent is below the waterline." 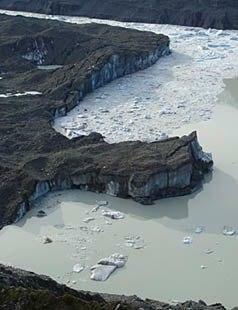 Callesen said the Tasman Lake is now full of icebergs with more than 20 that are 50m by 50m above the waterline. "These 'bergs now take on a life of their own, flipping, turning and moving as natural forces take action. Callesen said he and Glacier Explorers staff were "incredibly excited' about the coming season. "We are expecting the most spectacular season ever here, with stunning viewing of nature in action. Visitors will be able to get out onto the lake from early September and they will be in for a trip of a lifetime with sensational iceberg viewing. The current calving will give us ice to study for the next two seasons at least." The season will open with two trips a day increasing to five as the season develops. and some pretty tourist pics - before latest icebergs. Last year I visited NZ for the first time (and I hope not the last). It's really an outstanding country with breathtaking landscapes. We just drove around the Northern Island. I hope next time we will have the time to visit the South Island as well. THe icebergs look a little dirty, I hope they give them a jolly good clean up before the tourist arrive. Company I worked for in Wellington had a staff holiday home at Lake Tekapo, less than an hour to Mt Cook, Tasman Glacier. Twice I had it for a week, as part of three week south island motorbike trips. Tekapo Tourism photo gallery - Images of Lake Tekapo and the area. It's gorgeous down there, big country. That pic gives me nostalgia goosebumps, dry, cold, crisp. Beautiful. Tourists on a boat trip in Mount Cook National Park were subject to a rare treat yesterday, when a section of densely compressed blue ice at the base of an iceberg was briefly visible. 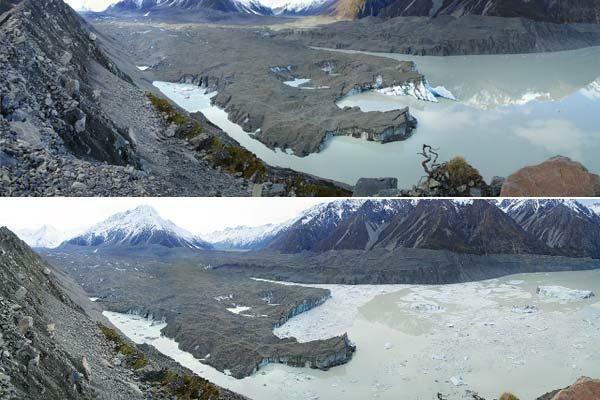 Denis Callesen, General Manager Tourism for Aoraki Mount Cook Alpine Village Ltd, said an iceberg which calved off the face of the Tasman Glacier last year rolled over as it floated on the glacier's terminal lake yesterday morning. In doing so, it exposed the clear blue ice crystals, which form when ice becomes so highly-compressed that all the air bubbles are squeezed out and the crystal expands. "This ice is so dense and compressed; it's five times harder than the ice you might have in your gin and tonic," said Callesen. "Each ice crystal is the size of a coffee cup, so when it's finally exposed to air, within two hours the air seeps into the weak spots around each crystal and it turns white." "This is the second significant iceberg rollover we've had this week... on Monday another one million tonnes of ice calved off the terminal face," he said. 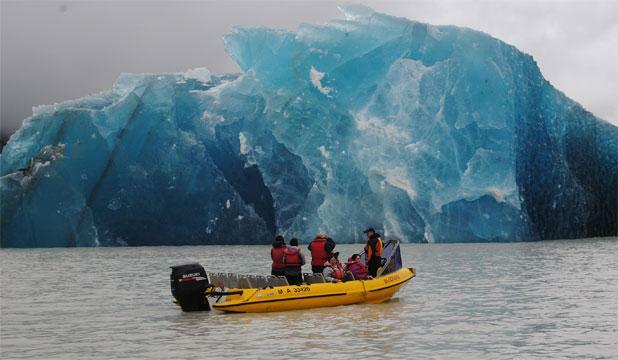 While blue icebergs are not uncommon - Callesen predicts two or three more rollovers on the scale of yesterday's could occur this summer - it is unusual for tourists to be on the lake to see them. "To get it that it happens during the day, not at night; on a fine day, not a cloudy day; on a calm day, not a windy day... all the gods lined up yesterday," he said. "In Disneyland they spend millions of dollars creating 'shows' like this, but here this is simply nature at work. "We're so very lucky that it's just given to us." 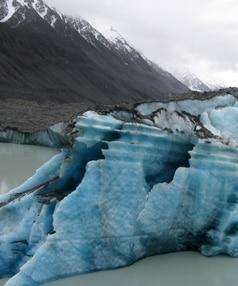 Glacier watchers on the Tasman Lake had an experience of a lifetime yesterday. 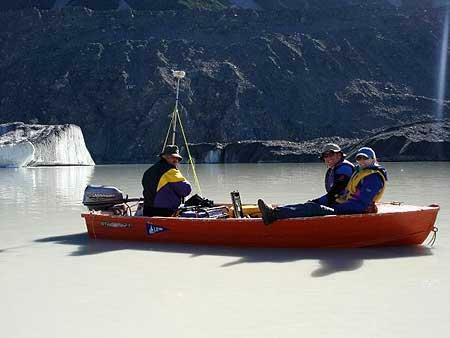 Two guides and 16 passengers were on two boats on the lake when the 6.3 magnitude Canterbury earthquake hit, triggering tsunamis and causing a massive ice calving off the glacier. Aoraki-Mt Cook Alpine Village Ltd general manager tourism Denis Callesen said the guides were radioed from the village as soon as the earthquake was felt, so were able to prepare for the event. Mr Callesen said the boats endured 30 minutes of tsunamis, up to 3.5 metres high. Staff are trained for the event, knowing to turn the boats towards each tsunami and motor gently forwards. About 30 million tonnes of ice calved – 1200 metres across the face, 30 metres above the lake and more than 250 metres below the surface to the bottom of the lake and back for about 75 metres. Mr Callesen said it was either the third biggest, or second-equal biggest event in Tasman Lake's history. 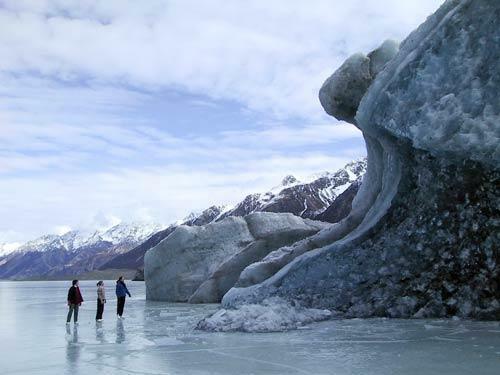 Christchurch's massive earthquake caused a 30 million-tonne chunk of ice to break off from the Tasman Glacier, about 200km away on the West Coast. 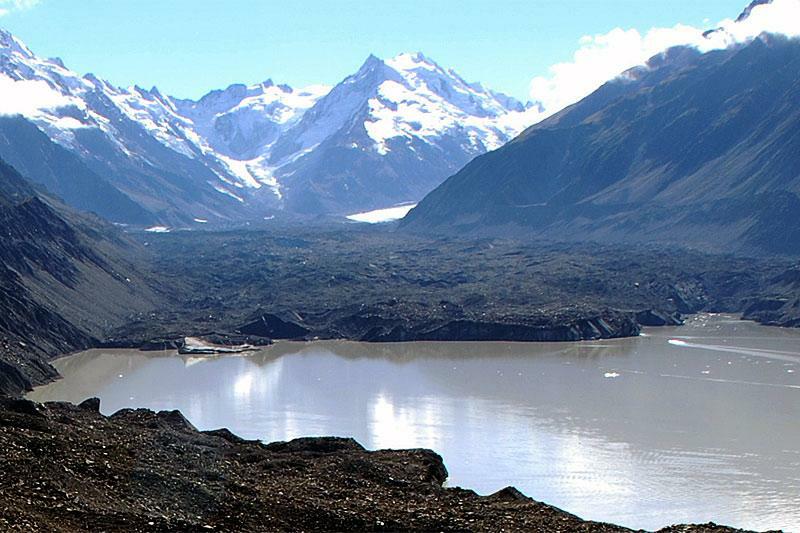 A 1.2km long, 300m high, 75m wide piece of ice on the face of Tasman Glacier, in Aoraki/Mount Cook National Park, plummeted into Tasman Lake as the earthquake struck this afternoon.